Even though it’s now a full day since the last batch of snow covered Rountop Mtn., the snow is still pasted to the trees like strips of Elmer’s Glue. 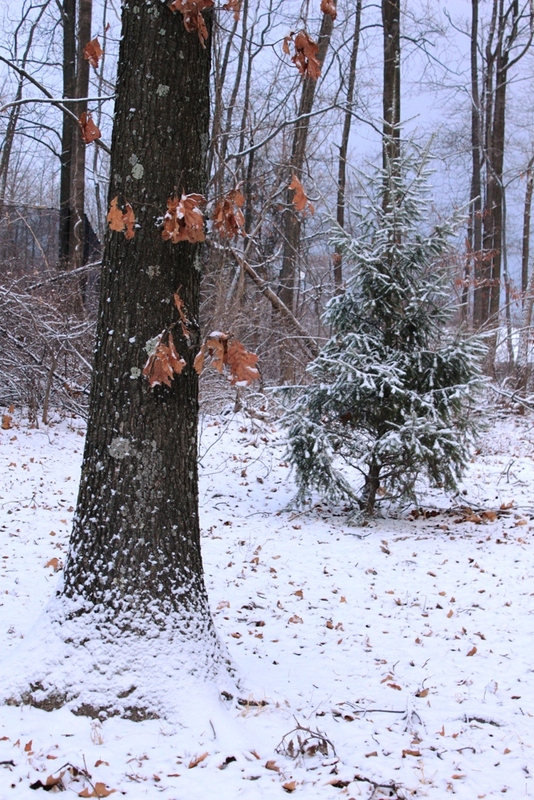 Usually, snow pasted on the trees falls off quickly. A little breeze is enough to disrupt it. The second half of Wednesday’s snow was wet and unusually sticky, and unlike most storms, a strong northwest wind did not follow this one, so that’s why the snow is still sticking. I’ve finished doing all the shoveling I need to do. The car is now back up by the cabin. I have a good, wide path out the chickens. 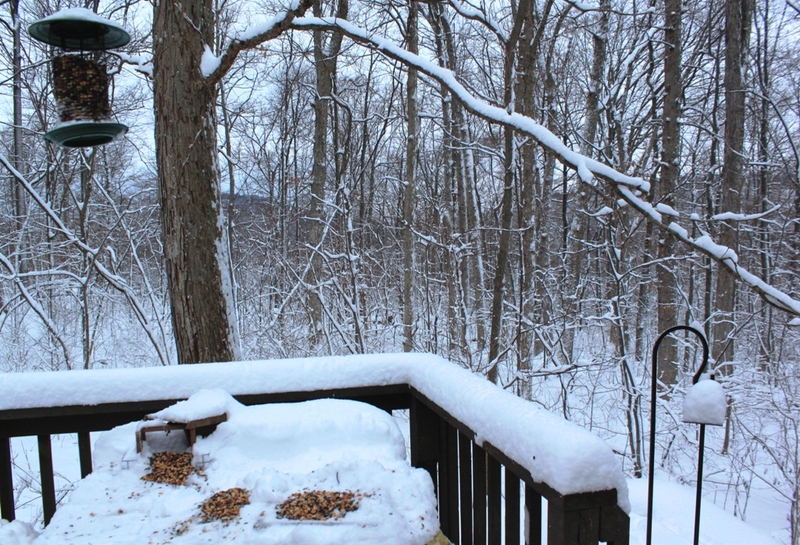 The steep back steps to the deck aren’t cleared, but I rarely use them in winter. Despite placing those anti-skid strips on the steps, they remain slippery as all get out, and I’ve fallen so many times (miraculously escaping serious bodily damage) that I don’t want to push my luck. And so it’s snowing again right now, though the forecast promises only an inch or so and the radar appears to bear out that prediction. Light snow is also forecast for tomorrow, and dark rumors of another possible Big Snow persist for sometime next week. I like snow, at least in part because it makes the landscape I see every day look like someplace different. I can’t say that I’m wild about shoveling, though. Over the year, I’ve developed my own shoveling technique. Lifting inches of snow onto my shovel is more of a workout than I want. So I’ve gotten into the habit of shoveling snow every time a couple more inches is added on the ground. That way I can usually push it out of the way, and I don’t feel as though I’ve taken up weight-lifting to get rid of the snow. I even get up in the middle of the night, setting my alarm when need be, to shovel the latest two or three inches away. Perhaps this ends up being more work, but it’s easier work and that’s good enough for me. And there’s the big advantage of being mostly done with shoveling by the time the snow stops falling, which means I can start playing in the snow right away! Like much of the east coast, Roundtop Mtn. got hit with another snowstorm yesterday. I tried to measure 10" but couldn't. I found 9.25", 9.75" and 9.5". 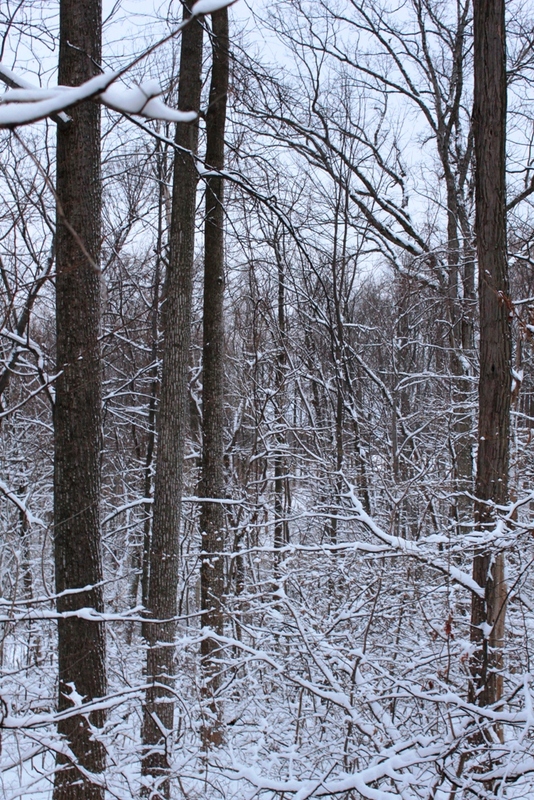 Snow is still pasted on many of the trees, so the entire forest is white and brown. The only color comes from the male cardinals, who are as red as a stop sign. I spent much of yesterday shoveling the decks and the driveway. I shoveled out to the chicken pen and dig out the car. The dogs never tire of the snow. Of course, they don't have to shovel it. Even the aging Dog rushes through the snow like a puppy. And Baby Dog, now in her prime years, is as silly as she was at 7 weeks. I see tracks of many animals in the snow. Deer tracks come right up to my front steps, and it appears two of them are munching on my juniper bush. Rabbit tracks cris-cross the lane. I haven't seen a rabbit in months, but I can tell they are still here. I see the hopping tracks of small birds, likely juncos. The snow muffles the sounds of the already quiet winter days. Just before dark I hear the very distant, barely heard call of a courting great horned owl. When the trees sigh with a barely-there breeze, I lose the sound altogether. 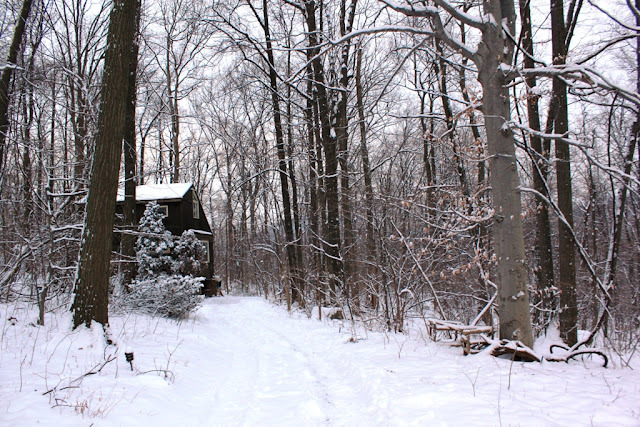 Oddly, when I have nothing to hear, suddenly the smells of the winter woods are mysteriously more intense--the piercing bite of the snow like a sour lemon drop, the sweetness of a white pine, the dry roughness of stones nearly exposed by the snow plow. Note: Today's photo was taken on Tuesday, the day before Wednesday's snow. I'll have a few photos of the bigger snow tomorrow. 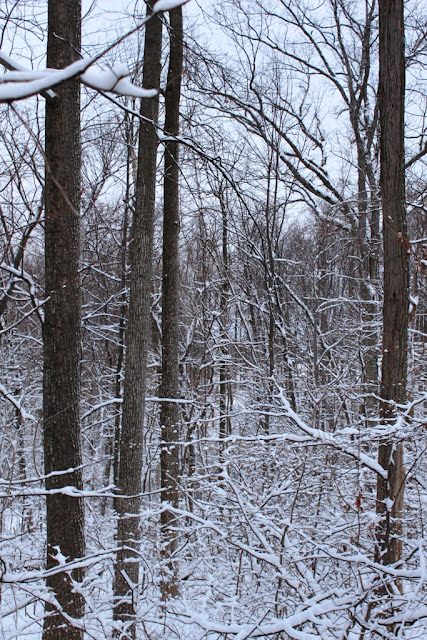 Sometimes I imagine that it would be a life well spent to do nothing more than to observe the goings on at my little patch of forest at Roundtop all day long, season in and season out, year by year. I would like to find a spot where I can see all around me and just experience the life of the forest as it changes and repeats its rhythms in all its subtleties. I’d like to know more about what goes on throughout the day (and night) than just my momentary glimpses, often when I’m actually doing something else. 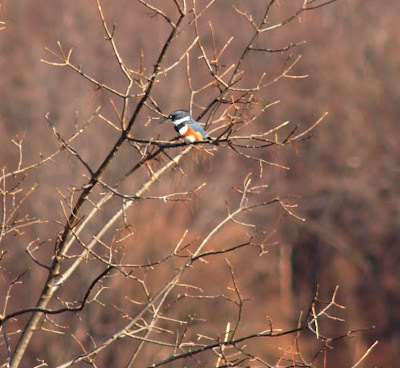 How often do birds travel through the trees in winter? How often do the rare or uncommon birds that I never get to see appear? Does the fox tiptoe behind my cabin every day or just as infrequently I see her? How often is the forest still and seemingly empty of activity? In real life, I wouldn’t have the patience for such an undertaking, even if I did have the time and the means to do it. I’d get fidgety before the first hour was over. And yet there are so many unanswered questions, answers I’d love to know, answers that are at least theoretically possible to know. And it’s not just the nuts and bolts of tracking the life of a forest that intrigues me. I’d like to better understand the complexities of a forest and its life rhythms. Compared to a forest, a human’s life is a short one, and better connecting with the more timeless nature of a forest would have its own value, I believe. Humans have much to learn from things that are more timeless than they are. Perhaps if I could examine my own timeless forest a bit more, I would divine more of her secrets. Lest you think that The View from Lazy Point, the book I wrote about in Saturday’s post, is nothing more than yet another call to arms about our species shoddy treatment of planet Earth, it’s not. It’s a beautifully written book about the rhythms of the year and the ocean at the far end of Long Island. Author Carl Safina is a careful observer of the life around him—the birds, the shells (and how those have changed over just a few years). His book about his life on this rather remote stretch of land is fun for me to read. I’m a mountain-dweller who observes life in my little corner of the Appalachians and who gets to a seashore only rarely, so I enjoy reading about how the seasons change and how the years progress at his place. We all have our own different places, each one worthy of a lifetime's exploration. Since we all only have one life, the only way I can experience, at least a little bit, another person's place is to read about it. My photo today was taken on this chilly 5 degree morning. The view is of one of Roundtop's snowmaking ponds and looking over to one of the bunny slopes. That’s an astonishing statistic, especially when you extrapolate it against the projected population of our planet by the middle of this century. Which, by the way, is projected to be at 9 billion people, another two more Chinas. Safina relates this to the fiscal deficit our country is running and reports that this kind of natural deficit is also one that simply can’t be sustained even over the short term, let alone the long term. It’s not just that we’re destroying the planet’s plants and animals, it’s that soon there won’t be anything left to destroy (or sustain our soon-to-be huge population, depending on your world view). Between needing more land for agriculture and more water for that agriculture and for us to drink, he believes it would take nearly two planet Earths to meet the projected demand, and that’s assuming this large population doesn’t all want to live like Americans. If they do, add in another half a planet earth. In other words, we are already borrowing (or stealing, again depending on your world view) heavily from people not yet born. And we’ve already overreached a level of sustainability on this planet. As a species, he says, we are good at solving puzzles, but not so good at solving problems. I hope he is wrong, but I fear he isn’t. And if he is right, we are already pretty much behind the eight-ball on this one. 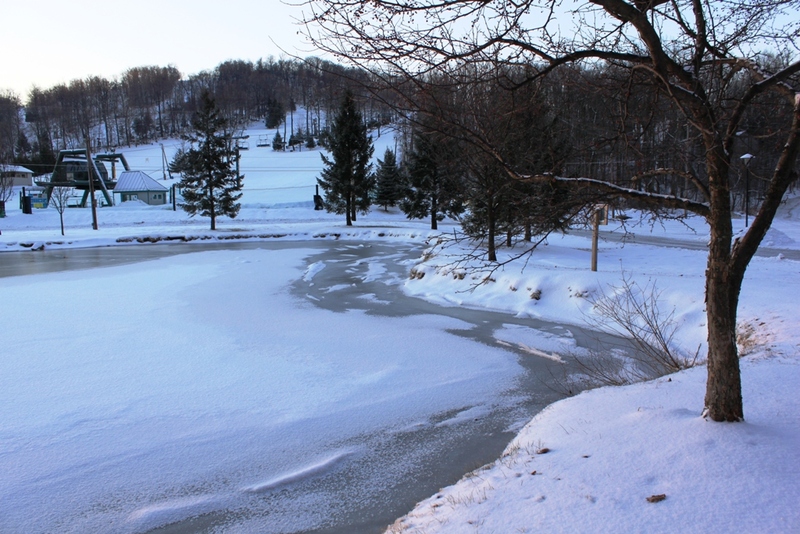 Thick ice covers the ponds and lakes this winter, thicker than it’s been for several years. December here was as cold as most Januarys, with only a day and a half near the end of the month that had some unexpected warmth. Now, in mid-January, the memory of that warm day is long past. The snow cover isn’t deep, just a few inches. Overhead, the sky is a leaden shade, the color of weeks old snow. The sun is missing in action and has been for some time now. I can’t even locate where it should be when I scan the sky. Even though there isn’t much snow, the weather feels as though snow is imminent nearly every day. Chill hangs in the air, and it’s a rare day when the wind is calm, rarer even than the sun. Daylight lasts a minute or two longer each day, a fact I appreciate and look forward to, though the extra daylight isn’t yet translating into extra warmth or brighter skies. Some days feel as though the entire day is just one step up from dawn, even at midday. My chickens are on winter egg break as I don’t have electric lights in their pen, and the natural light isn’t enough to keep them laying right now. Many people keep the lights on in their chicken pens to encourage the hens to keep laying. I still get one or two eggs a day from the girls, which is enough for me if not enough to sell. They've been on break now since early December, so I expect production will pick up soon enough. I’m told the lights eventually cause other problems for hens. They are more likely to develop tumors, for example. Since my hens don’t lay for commercial production, I’ll just wait for the longer hours of daylight and sunnier weather to return. After 15 straight months of laying, I figure my girls deserve a break. The lighting is so dull and flat that I didn’t take many photos this weekend. 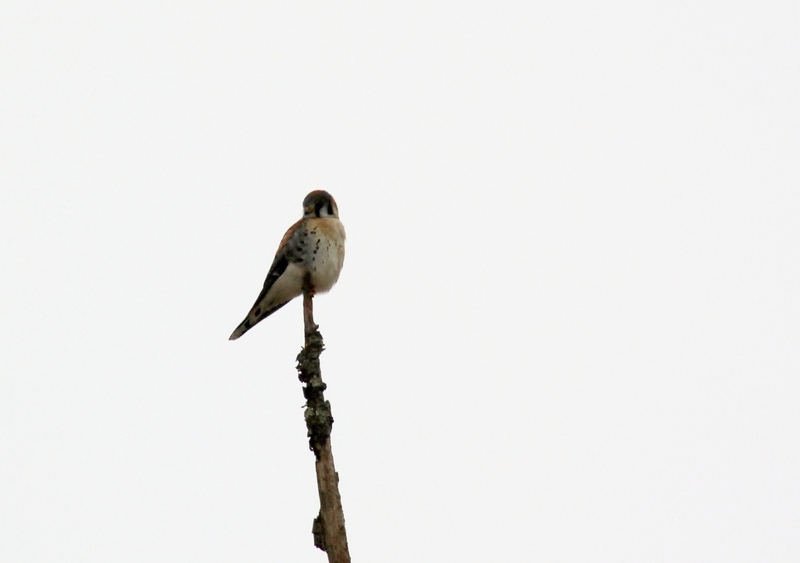 Even with nothing but sky behind this American kestrel, I was forced to brighten the photo just to see any detail at all. Something came after my chickens Saturday night. I hadn't been asleep for long when I heard the girls fussing. The fussing almost immediately gave way to frantic squawks. I raced outside in my pajamas with only slippers on my feet in several inches of snow. At first I didn't see anything but then a small dog-like shape appeared from beside the chicken pen. I thought it was a small dog with a long skinny tail but I couldn't tell anything more than that. I quickly chased it off and settled the girls. An hour or so later the girls started in again, and this time I was better prepared, as I grabbed my headlamp in addition to my slippers. When I got outside, the marauder was further away, and I could see its eyes in my headlamp but nothing else. The next morning the girls were okay, if still jumpy. When a hawk flew past to the north, they acted as though it was right overhead. Later, I kept thinking about what I thought was a small dog, and I've come to the conclusion that it wasn't a dog at all. I've never seen a stray dog around here, and I pretty much know all the dogs within a mile or so of the cabin. There aren't many and most of those are farm dogs. I now think my midnight marauder was a fox with mange. In the fall, I saw two foxes with an early or mid-stage of mange. They still had some fur on their bodies but the fur on their tails was pretty much gone. This nighttime predator struck me as being very short-haired at best. I didn't see any hair, just its silhouette, which reminded me of a small, short-haired terrier with a long, skinny tail. If I'm right that it was a fox with mange, I'm astonished that a fox could survive the winter without its fur coat. Perhaps that's what made it try for the chickens in the pen right under the cabin. It must be desperately cold and willing to take risks, such as approaching the cabin, that it wouldn't ordinarily attempt. The next morning, I reworked my chicken pen a bit, tightening up the edges, covering it up on the far side with a tarp. So far, I haven't had a repeat of Saturday night's attempt. I hope this predator, whatever it was, has learned its lesson. Roundtop Mtn. was brushed by the latest nor’easter to wind its way up the coast . I didn’t get a solid hit from it, but even that was still enough to drop 5-6 inches of snow, which is now followed by more wind than I like. The snow that fell was powdery and fluffy, so there is little traction. It’s a bit like trying to walk or drive on tiny ball bearings. By evening, this kind of snow should compress enough for the traction to be better, or so I hope. The sky is still just clearing, so my photos suffer from the barely-there morning light. I won’t complain too much about that, though; at least I can take photos in the mornings again. That’s an improvement of being 20 days past the shortest day of the year. Last night the dogs and I heard an unusual fox bark as we stood outside in the snow. When snow covers the ground, I don't wear or need a headlamp, and we take our nightly walks with only the night sky and the white snow to guide us. At first I suspected the sound came from a gray fox, and that may be the case. This morning I am thinking instead it was the mating bark of the red fox. 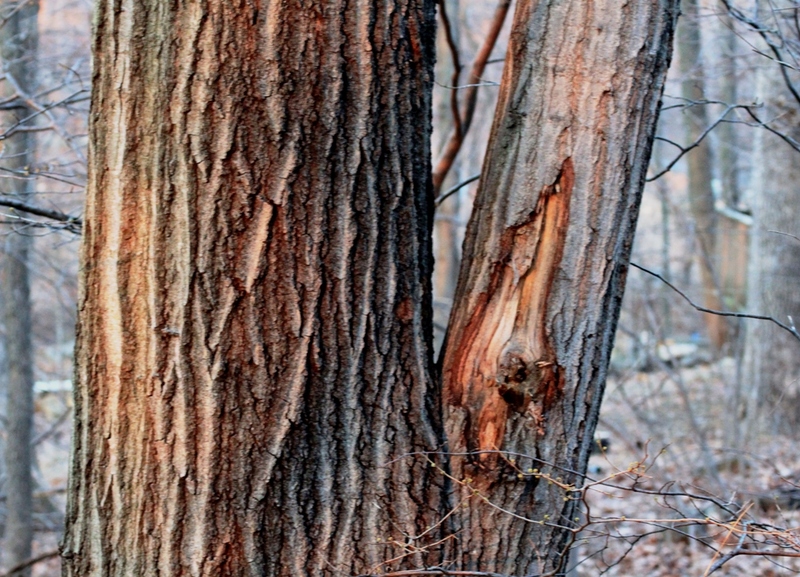 The bark was a two-note bark and made a reasonable amount of sound. Most of the time when I hear the foxes bark at each other, I think the sound is like a dog with laryngitis. The cadence is right, but the voice is hoarse. Once we startled the fox, it took off running, but didn’t stop its occasional barks. I could tell where it was as it ran down the mountain, getting further and further away until I couldn’t hear it any longer. 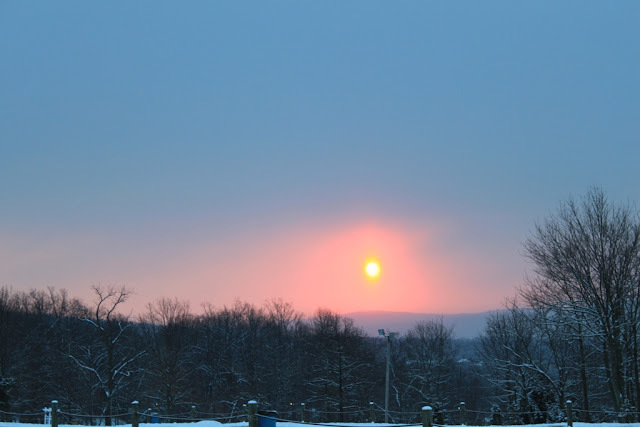 The sunrise photo was taken during a snow squall that veiled the sky, turning the rising sun a brilliant red and creating a beautiful sight to guide my slippery drive off the mountain this morning. Sometimes, the mountain landscape seems like a fantasy world, so different than what I see off the mountain, and this morning was one of those times. Sunday was a cold and blustery day, the kind that made me rethink my Sunday morning walk. Winds tore across the mountain, upturning my deck chairs with a clatter. Limbs littered my driveway and needed as much time to pick up as my cluttered living room. I opted for some car birding instead of a walk and drove to the Susquehanna River to see what was out and about. Anglers, apparently, are hardier than I am. 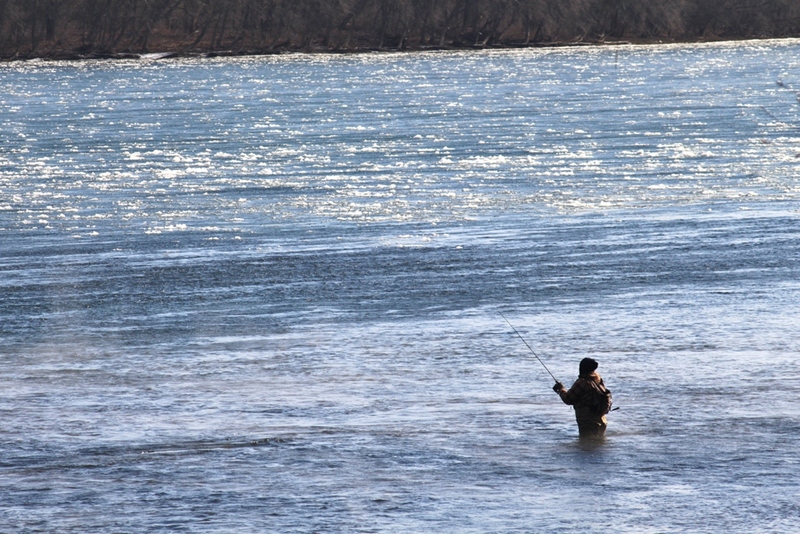 I drove down to the Susquehanna River in hopes of finding something new for my 2011 York County bird list. That’s where I saw the anglers. The first was the gentleman in my first photo, standing in the river, bundled against the cold, with chunks of river ice floating past in a continuous parade. Even standing in the river he looked more comfortable than I felt. My second angler was of the avian kind. 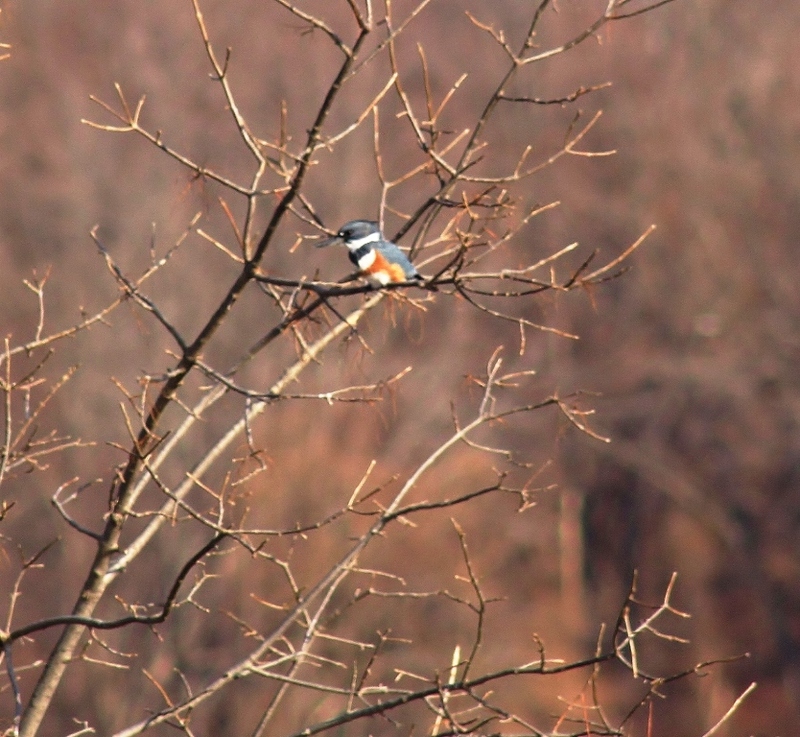 This belted kingfisher was perched in a tree within feet of the first angler. Unfortunately, neither angler appeared to be having a very successful morning. Despite the chill and wind, the birding was decent, if not spectacular. I added great black-backed gull and common merganser to my year list while at the river. Afterwards I made a swing past Pinchot Lake, where I scoped the birds on the lake’s one area of open water. The water was kept open in a small area by the united paddling of several hundred Canada goose feet. There, I also saw a small flock of common goldeneyes. My year list is coming along, considering that it’s January. My walking? Well, I guess there’s always next Sunday for a nice long one of those. More snow this weekend brought more birds to my feeders. Even the usual birds are less cautious or fearful when it’s snowing. My thought is that they go into a mode where they try to expend less energy, perhaps because they are less sure where their next meals are coming from. I’ve seen eagles act like that, holding to their perches when I walk right underneath the tree they are on. Flying takes a lot of energy, and birds are willing to put up with humans or other activity that they wouldn’t ordinarily put up with when they are conserving energy. Since the big birds act that way, why not the littler ones too? And that inclination certainly makes getting photos easier! The temperature has remained stubbornly below freezing for some days now. The wind that accompanies the temperature is what really bothers me. Yesterday, I wore long underwear, heavier pants and snow pants on my lower half. My upper half had a flannel shirt, heavy sweater and over top of all was my down parka. I still shivered whenever the wind kicked up, which it seemed to do all day. Inside the cabin I keep the temperature at 62 or 63 degrees during the day, which feels plenty warm and comfortable to me. Of course, there’s no wind in there. In case you were wondering, my photo today is of a female red-bellied woodpecker, a regular and common visitor to my feeders. The species is not well-named, as even with a photo that looks more or less right at the bird’s belly, you won’t see red. The males have a rosy wash between their legs. That’s about as close to a red belly as any of them have. 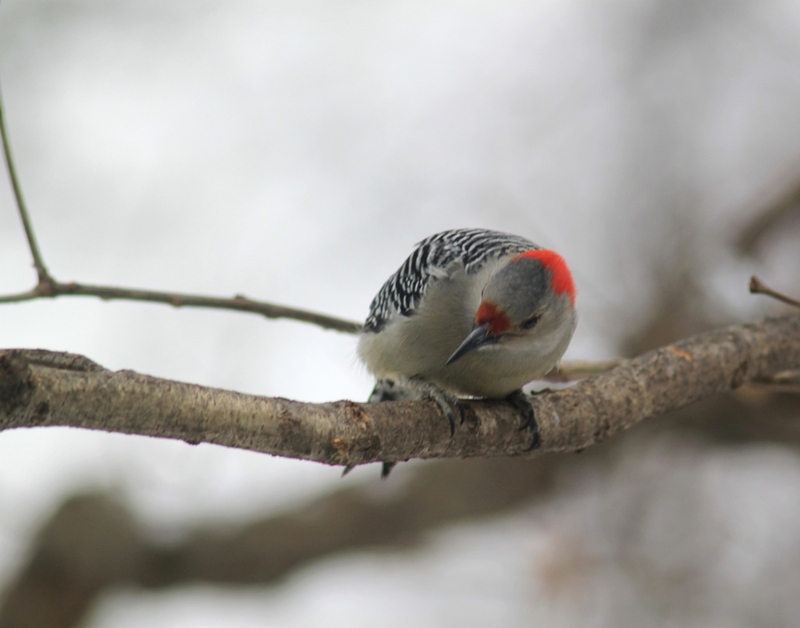 The woodpecker was named by someone holding a collected or shot bird in their hand. That’s about the only way you’ll see anything resembling a red belly on one. 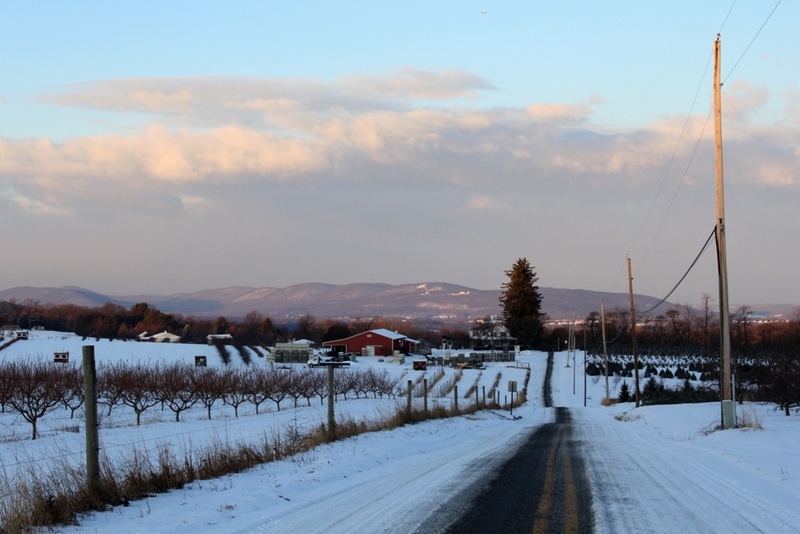 All it took was half an inch of new snow to transform the brown landscape of Roundtop Mtn. I might even be overly generous when I describe it as half an inch. It sure didn’t take much snow to give the place an entirely different look. The trees were all wearing their Swan Lake tutus this morning, with snow swirling around the bases of them. The lane up to the cabin is a ribbon of white. Even in the pre-dawn darkness, I could have driven it without headlights to guide me. This morning the snow surprised Dog and Baby Dog. Baby Dog exploded out of the door, and her feet went in all directions. She was that excited. Dog, who is now an elder statesman at almost 10, was somewhat more dignified—until his feet touched the ground. Then all he wanted to do was run like a puppy with his nose to the ground. The chickens were not as amused, giving me that “I don’t know about this” sound they have when they are suspicious of something but can’t really put a finger or a toe on just why. My feeder birds arrived very early this morning. I’m not sure I could truthfully call it dawn when the juncos appeared and waited on the back deck for me to fill the feeders. It was still so dark I could barely see the juncos, but they were already there and waiting. I guess I can say that snow transforms more than just the landscape. The animals’ behavior was transformed, too. One thing I enjoy after the leaves fall in autumn is to look at a pile of leaves and try to identify the tree species they came from. 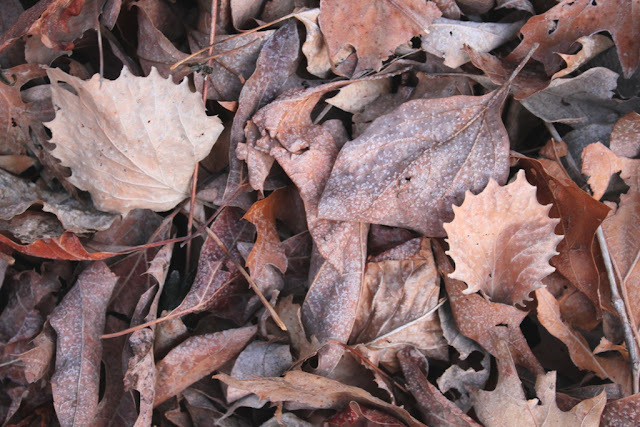 Leaves get blown in from all over the forest, so the leaves I see do not always correspond to the trees in front of me. That’s part of the fun. In this pile I see eastern dogwood, cottonwood, white oak, perhaps a red oak or two and wild cherry. Oddly, I don’t see any hickory or beech, which, after the oaks, are probably the most common species here on Roundtop Mtn. Leaves, even dropped ones like these, are a riot of interesting textures and shapes and come in a variety of shades of brown. I never run out of leaf piles here in the forest. I make a few feeble attempts to keep them from being knee deep on my front and back decks, but I’ve long since given up trying to rid myself of them entirely. When you live in a forest, leaves are ever-present. Even now, I have to broom them off the decks at least once a week. The only way I won’t have to broom them all winter is if I get some snow. I look at people who blow one and two leaves at a time off their yards as though they come from another planet. Those folks would probably explode at the thought of living in the woods where they are surrounded by billions and billions of leaves. 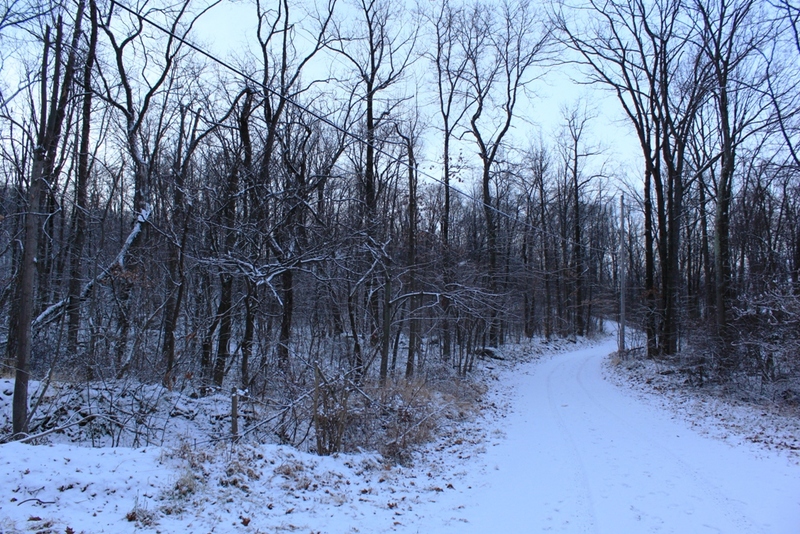 Winter 2010-11 on Roundtop Mtn. is so far much the way of typical winters here—mostly a dry and chilly season. The dry part means I see a limited amount of snow or any other form of precipitation and that also translates into winter being a largely brown season in the forest. For me, the brown season presents challenges to photography, especially during this part of the winter when I am rarely at home during the brightest hours of a day. 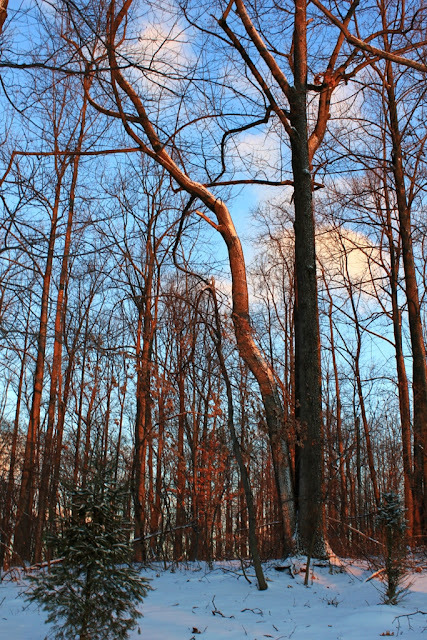 Browns dominate my landscape—brown tree trunks, brown leaves on the ground, brown branches. Variation in color during a brown winter, when I find it, is subtle, often the result of forest textures or ebbing light. And yet, I find winter’s subtleties a calming influence on my sometimes frenetic activity and scattered thoughts. 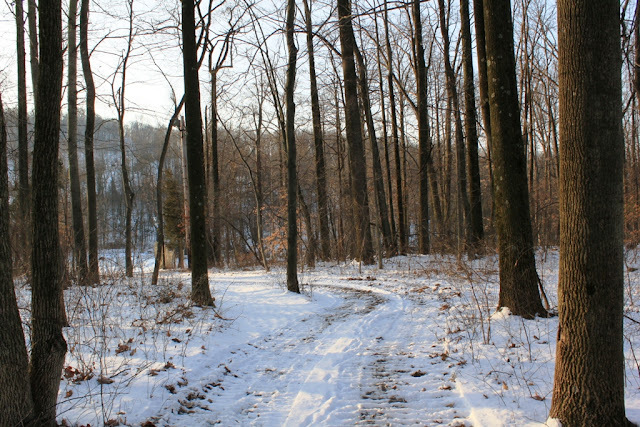 To see and appreciate winter’s nature, I have to slow down and look for it. Winter’s charms do not jump up and demand my attention. Winter makes no demands and expects no recognition or applause. I have to search for the season’s special nuances, a welcome change from the high drama of the warmer seasons. And yet, as much as I enjoy the slower pace, it takes me a while to find that groove again, to explore the slowness and decreased intensity. For me, the price of doing more, of speeding up to do more things, always reduces the depth of what I do. Speed means hitting the high points and ignoring everything else. Winter reminds me yet again that more isn’t better. Doing fewer things really means doing the things I do more completely, which is why so often, doing less really does mean doing more—doing more completely.